This is the one we refer to as the "St. Patrick's Day Show". 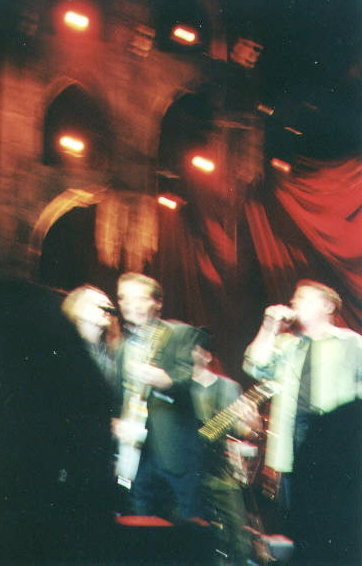 Don was doing a few solo dates in the spring of 2001. This was a weird time to be an Eagles fan. Don Felder had been fired at the beginning of February and the band really hadn't done much together since being inducted into the Rock and Roll Hall of Fame in 1998. A night or two before, Don played at the Hard Rock in Las Vegas. At that show, he announced that Glenn was in the audience and that they were going to go to Europe to make a "...shitload of dimes." (Blazing Saddles reference). This was significant because it was a signal that the band intended to go on without Felder. Little did we know that Glenn (and Timothy) would actually show up on stage in Los Angeles the next night. It must have been the luck of the Irish. Here are our recollections as we wrote them at the time. Dirty Laundry The show started the same as it has for quite some time (except for that brief deviation into starting with Boys of Summer). 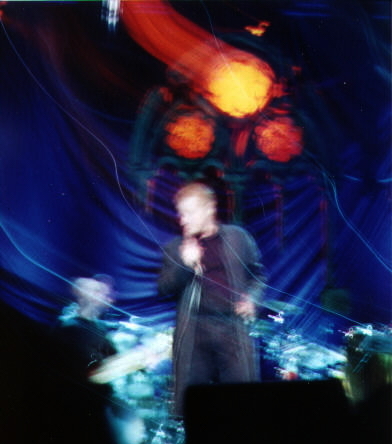 Don took the stage dressed in a long navy duster-like coat over a black t-shirt. The coat has a zipper and has been professionally frayed at the bottom. The crowd was pretty responsive and seemed excited to see Don. Perhaps that was due to the fact that the show started quite late (Don took the stage at about 9:50) and that we all had to stand outside for over an hour before the show. Sunset Grill Before starting this song, Don let everyone know that he was in a devilish mood. He first told everyone to sit down ("....take your seats, please...there will be time for standing up later!") and then went into a rant about the Sunset Grill. He explained that the real Sunset Grill was gone and that the one that had taken it's place was a fake. "Even though they have my name on the freaking menu". He said that they had a gold record on the wall that "..must have been stolen" (note to Don...not every piece of memorabilia that is acquired by a fan is stolen). He also went into this magically delicious Irish leprachaun voice and said his "...Irish was up". Sunset Grill was nice. He brought out the entire horn section that he had at the beginning of the tour. His singing voice was just a bit hoarse, but when he spoke, you could tell that it hurt him. Everything is Different Now Before this song, Don promised that we would have several surprises during the evening. We hoped he didn't mean the horn section was it. The Waters Family Choir came out to accompany Don on this one. He asked if anyone had seen the video. The ...weird video. Nobody in the audience really said anything He said, "...well, me neither!" and went into the song. Last Worthless Evening The only thing we remember from this is the knowing face Don made when he sang the "...sleepy bedroom town" line. He also has made the hand gestures (counting how many times he's been round the block...big mistake) a routine. It was cute, though, when he bent Waaaay down to peer under the shades that are all pulled down. Workin' It Just love to watch Don sing this one. One of the highlights of the show! New York Minute After this song, Don dedicated it to people who had lost money in the NASDAQ. When people groaned, Don said, "...yeah...me too!" You're Not Drinking Enough Frank needs to get up some balls and remind Don that they did this song in 1993. Don keeps insisting that they haven't done it for 15 years. Argh! Anyway, he introduced the song by saying it was by his friend Kootch. We were all supposed to say hello to Kootch. When we did, Don said he was in CT and couldn't hear us, so he'd pass on the message. This song has always been one of our favorite live performances. He's gotten a little campy with the faces and gestures, but when he jumps up and down in Ay Ay Ay Ay angst...oh my!!! Inside Job This works so well live. Excellent performance! For My Wedding Don did the usual...you have to sit down to sing about weddings joke. He mentioned that 50% of marriages end in divorce but that he was just the messanger. Nice delivery of a simple song. A Night in Summer Long Ago Don dedicated this to his mother who is "...of Irish descent". He introduced the three Irish musicians (Irish bagpipes, pennywhistle and fiddle). He told the crowd that the song was by Mark Knopfler of Dire Straights. Don said that we need Dire Straights back to compete with the crap on the radio. Loved the way he said "...crap, crap, crap". He also admonished the crowd to stop already with the cameras "Gitcher pitcher takin' done! You've had an hour"
Irish Jig Don didn't give us the title, but just let the three musicians play a little tune. It seemed spontaneous when Don went to sit behind the drums and messed around with the big puffy mallets on the snare. It was very cute. Boys of Summer Always amazing done live. What else is there to say? Life in the Fastlane Before this, Don told the crowd to "...stand for the national anthem". Kind of funny seeing as how this was the anthem played before the Eagles vs. Rolling Stone softball game. This, of course, got the crowd really going. "Are you with me so far?....Thank You!" Heart of the Matter This is always a crowd pleaser and tonight was no exception. All She Wants to Do is Dance "Now that we've repented, let's dance!" As those of you who have gone to the shows know, Danny Reyes does an amazing percussion solo before this number. 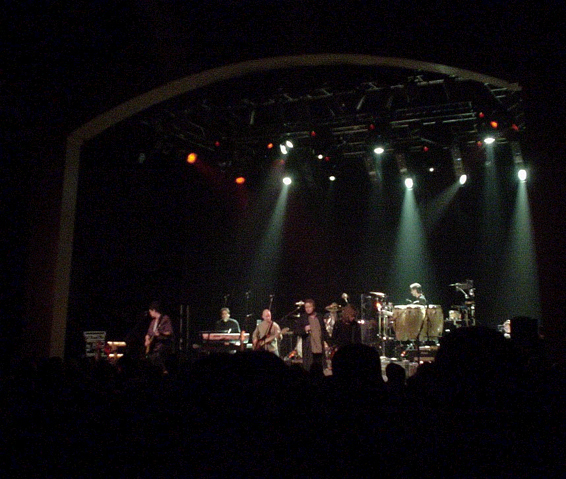 The rest of the band (including Don) stands off to the side clapping while he does his thing. Don was riveted to what Danny (and later Rob) was doing. As he stood there and clapped, both of us (independently) thought he looked 10-15 years younger. He was smiling and really enjoying the percussion show. Long Run As ASWTDID was winding up and guitars were being exchanged, Lisa screamed "There's Glenn! There's Glenn!!!" 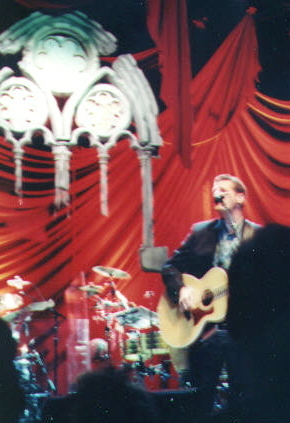 and sure enough, Glenn Frey walked up on stage. The crowd went wild. They went even more wild when Timothy joined them. Glenn was wearing a dark jacket over a greyish shiny shirt. He was also wearing his backstage pass (dork!<G>). Timothy was also wearing a loose grey shirt. Don went into The Long Run and the place became magical. We may take heat for this, but as far as we were concerned, we were watching the Eagles. You couldn't have counted the smiles on Don and Glenn's faces if you tried. They were so happy and so full of joy at being on stage. Hotel California Those who hate the new Henley version of this will probably be upset that Glenn seemed to have no problem with it. He did have a problem, though, trying to figure out what to play on the guitar. He kept smiling, though. At one point, Don tried to coax him over behind the "dangerous horns" to play maracas with him. Glenn's guitar cord wouldn't reach, though. These two guys are amazing when they are "on" and they were most certainly "on". End of the Innocence We really like the new piano-less intro. Excellent job on this as well. I Can't Tell You Why When they left the stage after HC, we thought we had Timmy and Glenn were finished. Not so. We noticed the techs adjusting the drum set. Sure enough, when the band came back for the 2nd encore, Don was behind the drums and Timothy was at the mic. Glenn played the electric piano. Seemed like an Eagles show to us! Peaceful Easy Feeling I don't know if words can describe how incredible this was. There's that moment in the song when Henley comes in on the harmony "I found out a long time ago...what a woman can do to your soul". That is magical. The blending of the two voices coupled with the smiles and the entire audience singing along. We had all found our pot of gold! Taking You Home Another encore! This was also well done. We don't remember much of it. We were still on our Eagles high! Desperado How fitting. You know that part where Don holds that note for sooooo long. This time, after he did it he paused. Made a cute face and said, "...coulda done that longer!" Don closed the show by thanking everyone on behalf of himself, Glenn, Timothy and Joe for a 30 year wild ride. He said they'd be back soon. We believe him. random notes: Jackson Browne was in attendance. The Staples center was maybe 3/4 full. We have a few photos from the show sent in by viewers. Remember, this is with 2001 technology. Thanks Patricia and Mike.